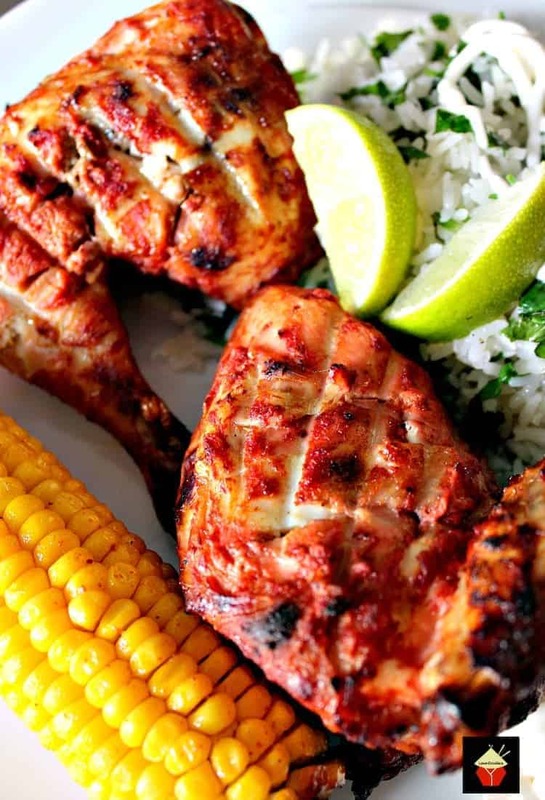 Flattened Moist BBQ Garlic and Lemon Chicken with a delicious marinade to give you juicy chicken everytimeFlattened Moist BBQ Garlic and Lemon Chicken with a delicious marinade to give you juicy chicken every time. Easy instructions of how to cut a whole chicken into portions. Flattened Moist BBQ Garlic and Lemon Chicken. 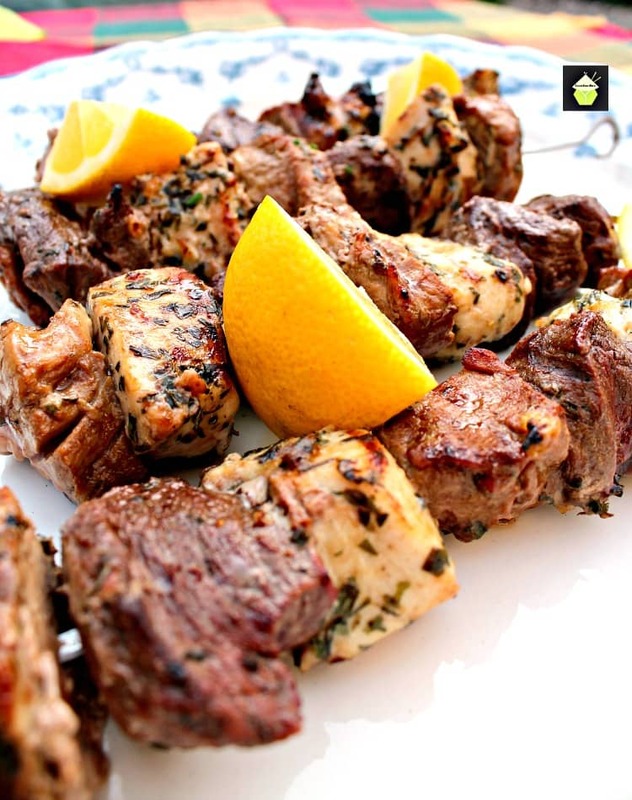 This is a lovely recipe with a delicious marinade made up of tarragon, lemon, and garlic. All three of those ingredients go so well together. 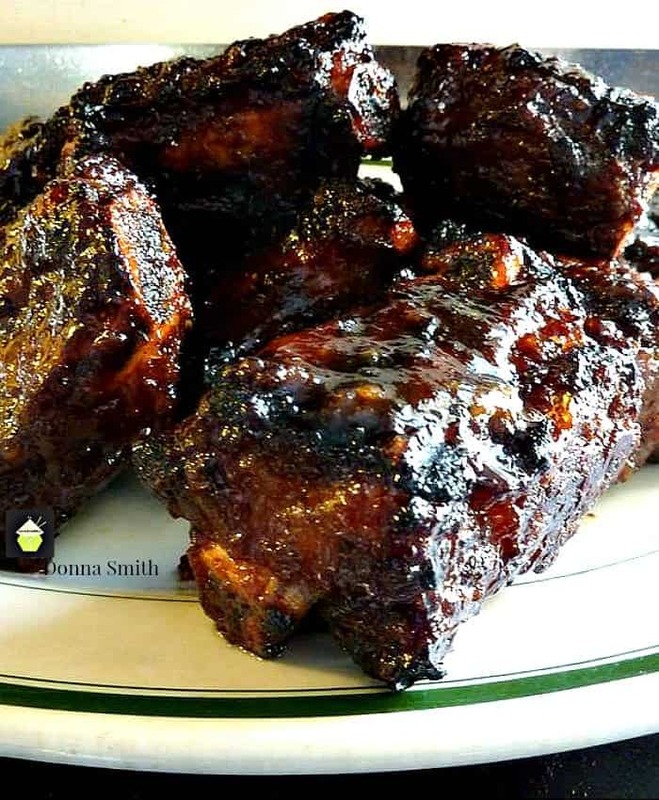 When you add a little chili to the marinade, it gives a slight kick to it, so for those of you who love a little heat, then feel free to add a bit more than stated in the ingredients. 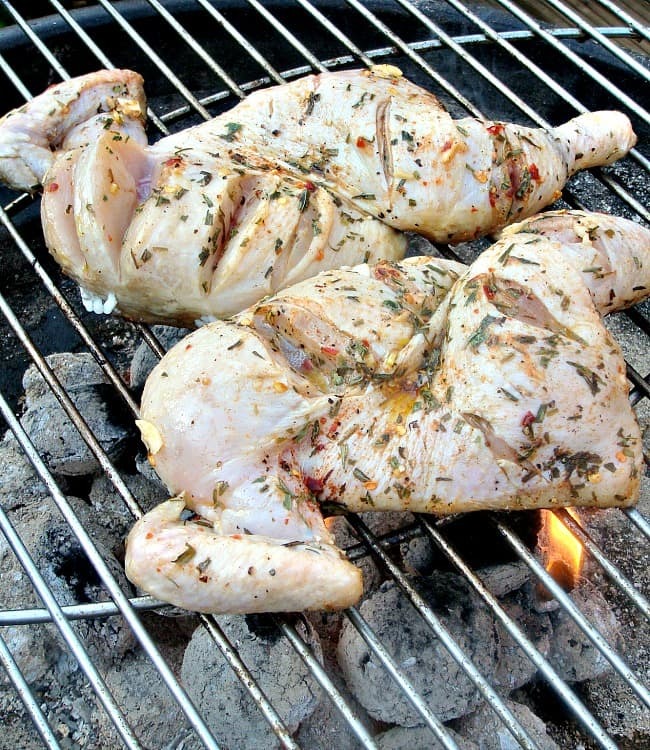 Grilling chicken can sometimes be tricky if you are using the breast part of the chicken. It can often become very dry or overcooked, so this marinade will keep the chicken succulent and juicy, and of course full of flavor too! I often buy whole chickens and cut them myself into portions, such as quarters or flatten them ready for the oven or grill. It’s much cheaper to do this and keeping the chicken meat on the bone during cooking adds not only to the extra flavor but helps to retain the juices during cooking and you end up with a really tasty, juicy and delicious piece of chicken. So below, I’ve added some easy instructions with photos for those of you who would like to know how I cut the chicken into portions and flatten it for the BBQ so it cooks more evenly. It’s easy to do, you just need to make sure you have a sharp knife. I use my Chinese cleaver because I find it the easiest to use. If you’d like to get one, we can recommend this one, which is the same as you see in the photos below. I use it for dicing and fine chopping too. It’s great! 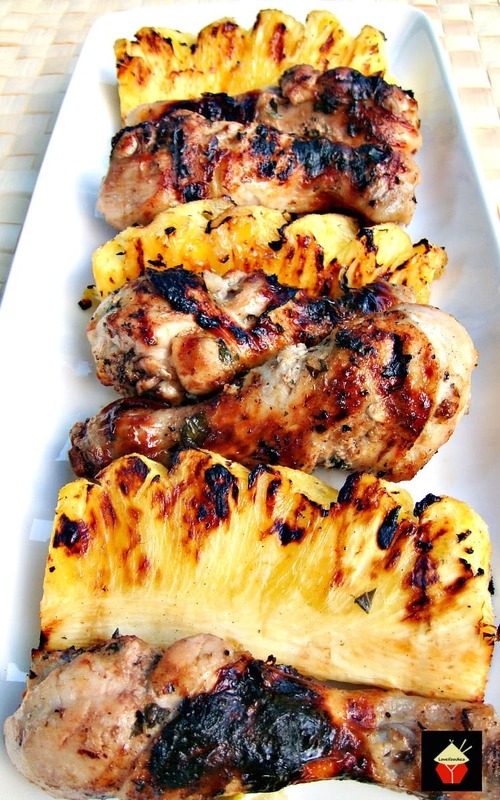 You can use this recipe for an outdoor BBQ / Grill, or indeed in the oven. You can also prepare the chicken ahead, and if it is from fresh, i.e not been defrosted, you can add the chicken and marinade in a zip lock bag and freeze until you need it. Simply defrost and then cook as stated below. Here I have made a recipe which will give you a delicious flavor of garlic, lemon, tarragon, and chili, which, in my opinion, enhance the chicken flavor and keep it very moist indeed. 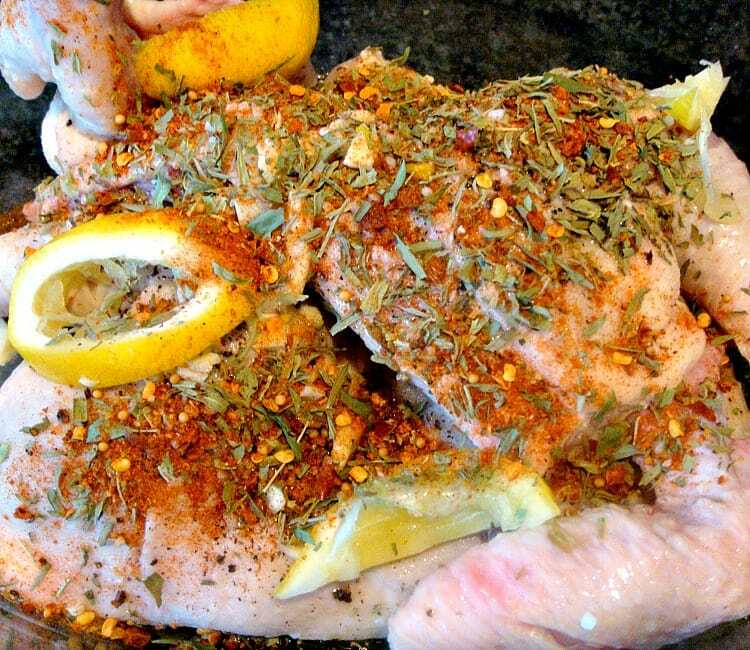 You can choose your favorite herbs to add, such as rosemary, oregano, etc. The choice is yours! But for me, lemon, garlic and tarragon really do compliment each other and go perfectly with chicken. Here I have used chili amounts which are mild, more for flavour than ‘heat’, so this recipe is not spicy hot . You can also use this preparation method to cook chicken in the oven, turns out moist and really tasty! **Please note, if using a larger chicken, cook times will be a little longer and will require a pre-cook in the oven for 20 minutes. 1. First of all, we need to prepare the chicken. 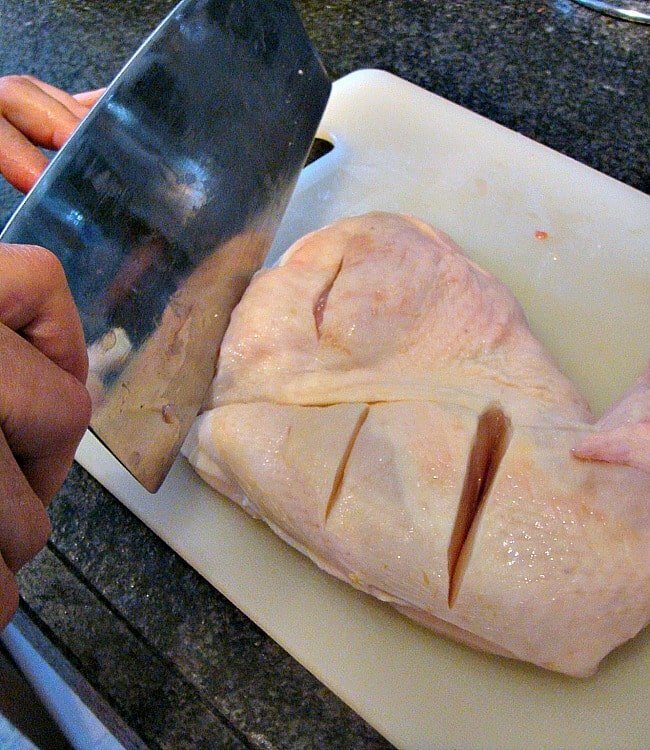 Here I will show you how to cut the whole chicken and flatten it ready for the marinade. if you know how to do this please skip this and move to the marinade instructions below. Step 1: Stand the chicken up on so the wings are sitting on the board. Cut straight down the middle. Step 2: Open out the chicken and see where my finger is pointing in the photo, you will see a white cartilage, cut straight through that all the way along the chicken lengthways. Step 3: Cut all the way right through the chicken. Step 4. 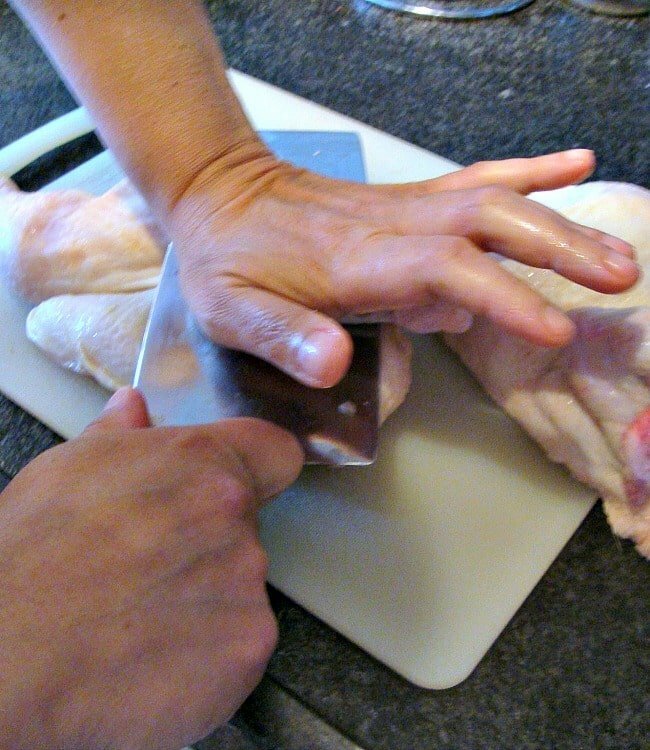 Once the chicken has been halved place on the board skin side up and using the flat side of your knife push down until it is flattened a little. If you don’t have a suitable knife place the chicken in a zip lock bag and use the base of a heavy saucepan and push down flattening the chicken. You may have to exert a little pressure to push, or find someone with some strong muscles! Step 5. Once flattened, using your sharp knife, run deep slashes into your chicken, pay particular attention to the thicker parts of the meat as this will take longer to cook if there are no slits in it. 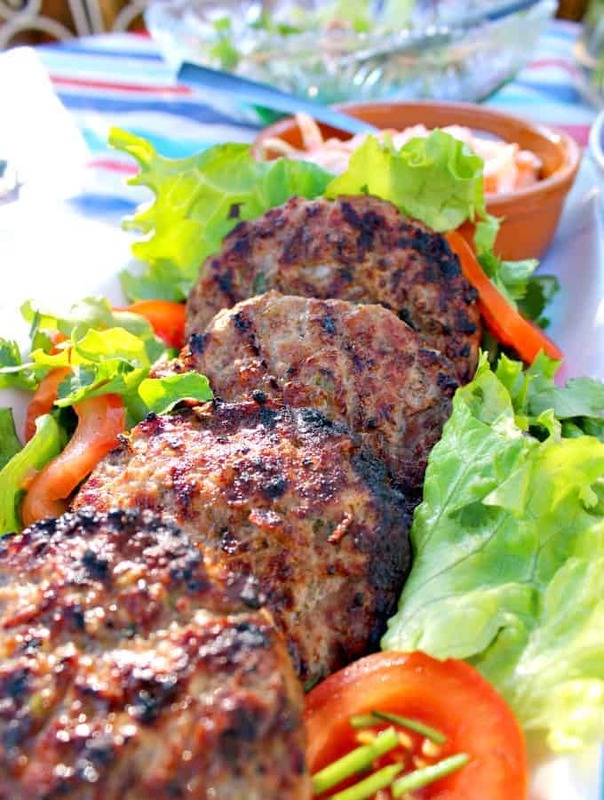 The slits help with the cooking and also the marinade to penetrate the meat. Place the chicken pieces in a large bowl or suitable baking pan and add all the marinade ingredients to the chicken, and with the lemon, cut in half first, squeeze the juice all over the chicken then slice up the used lemon and add it to the chicken. Use your hands to rub everything together, and then place skin side down in the container. Cover and leave to marinate in the fridge for 30 minutes minimum, 2 hours is the best amount of time. **It is at this stage, if your chicken was not pre-frozen, you can place in a zip lock bag, perhaps in portions if more convenient, and freeze until you want to cook them. 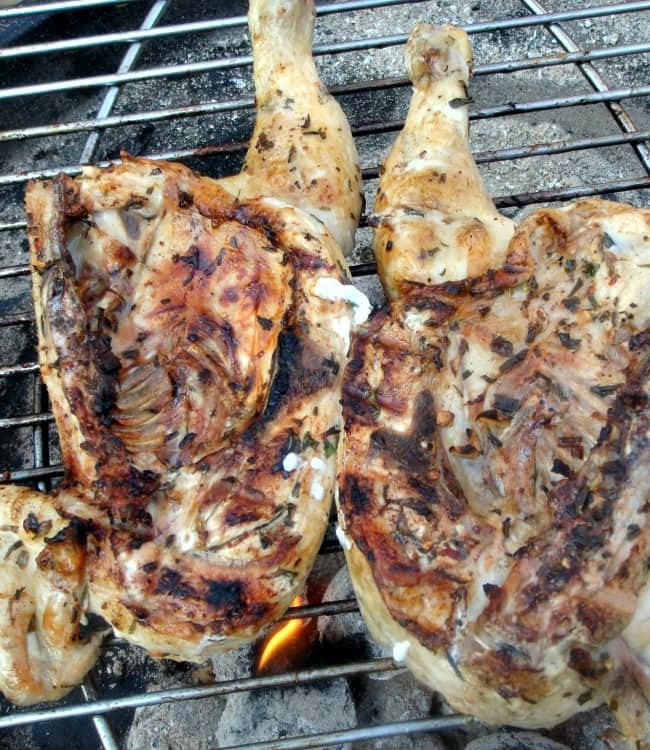 Once the chicken has marinated, place on the grill / BBQ and turn frequently until the juices run clear from the thickest part of the chicken meat (the breast and thick part of the legs). For larger chickens, place in a preheated oven, at 190 C / 375 F Gas 5, covered with aluminum foil for 25 minutes and then place on the grill / BBQ and cook as normal, or continue cooking in the oven until cooked if you are not grilling. Serve with my Chinese Style Sweet n Sour Salad and Baby Garlic Potatoes! 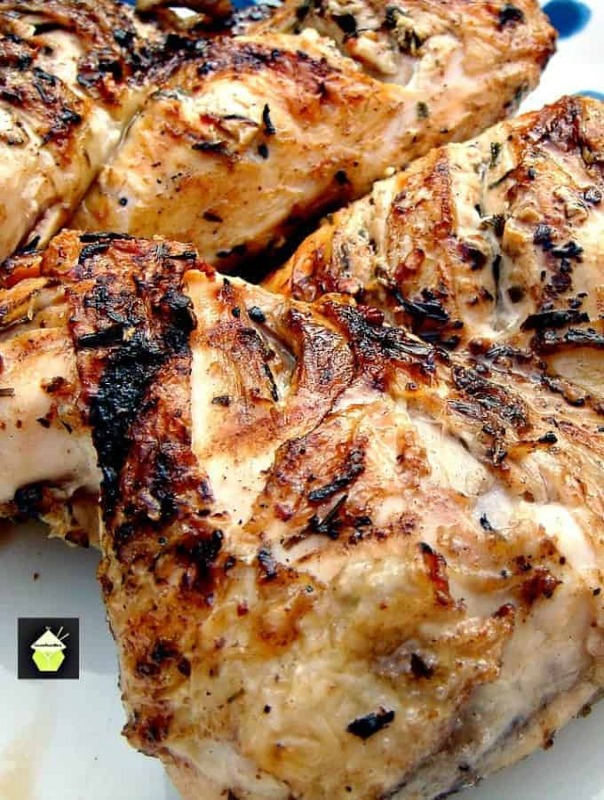 Flattened Moist BBQ Garlic and Lemon Chicken with a delicious marinade to give you juicy chicken every time. Easy instructions of how to cut a whole chicken into portions. First of all we need to prepare the chicken. Here I will show you how to cut the whole chicken and flatten it ready for the marinade. if you know how to do this please skip this and move to the marinade instructions below. Step 1 : Stand the chicken up on so the wings are sitting on the board. Cut straight down the middle. Step 2 : Open out the chicken and see where my finger is pointing in the photo, you will see a white cartilage, cut straight through that all the way along the chicken lengthways. Step 3 : Cut all the way right through the chicken. Step 4. 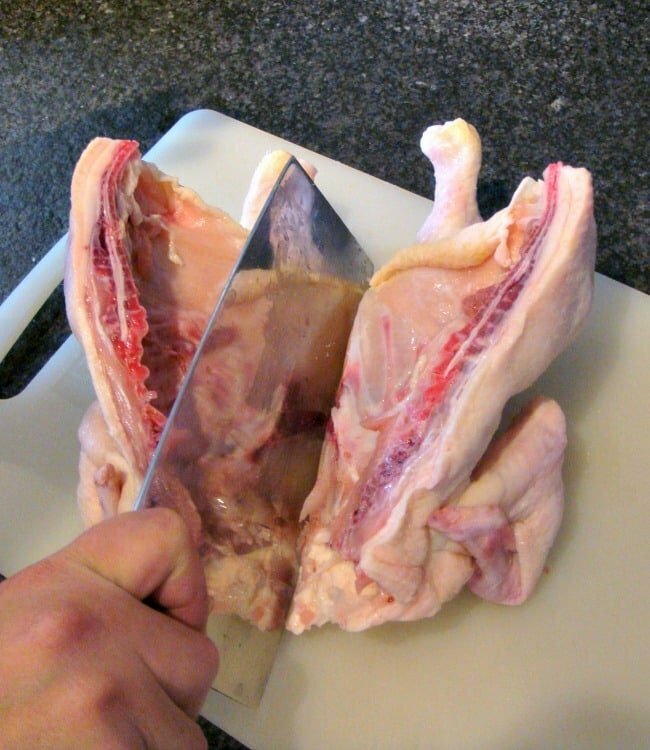 Once the chicken has been halved place on the board skin side up, and using the flat side of your knife push down until it is flattened a little. If you don't have a suitable knife place the chicken in a zip lock bag and use the base of a heavy saucepan and push down flattening the chicken. You may have to exert a little pressure to push, or find someone with some strong muscles! 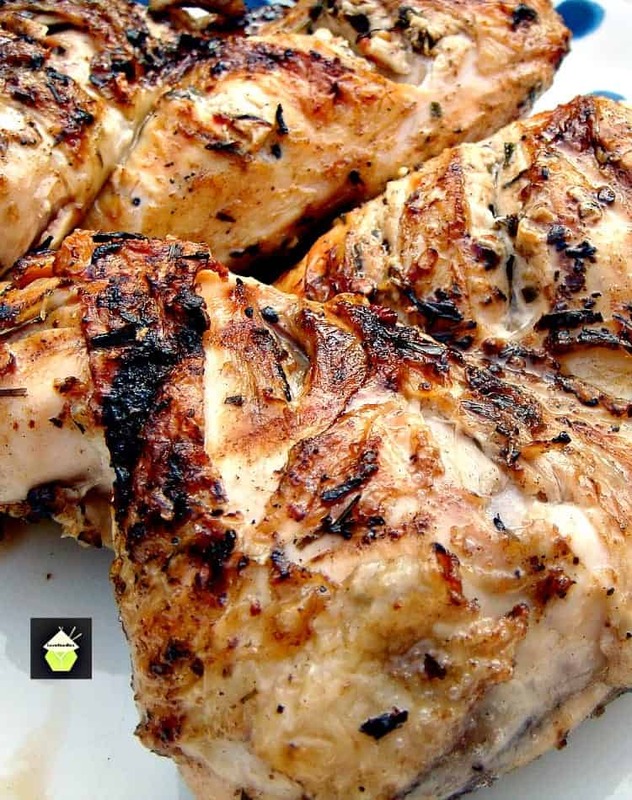 The marinade: Add all the ingredients to the chicken, and with the lemon, cut in half first, squeeze the juice all over the chicken the slice up the used lemon and add it to the chicken. Cover and leave to marinade in the fridge for 30 minutes minimum, 2 hours is the best amount of time. For larger chickens, place in a preheated oven, at 190 C / 375 F Gas 5, covered with aluminium foil for 25 minutes and then place on the grill / BBQ and cook as normal. or continue cooking in the oven until cooked if you are not grilling. You can cut the chicken in to how ever many portions to suit. 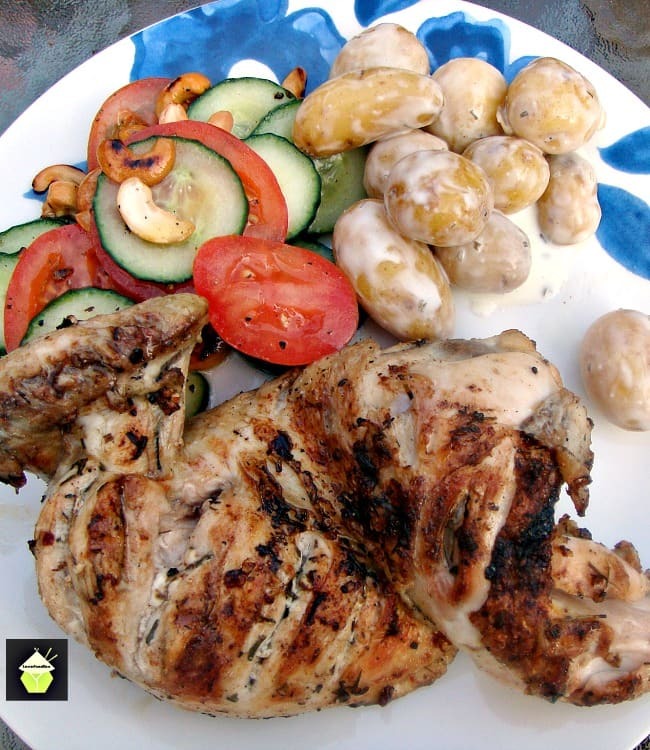 For this recipe I simply halved the chicken, but feel free to cut in to quarters or smaller.